Drama Online contains hundreds of plays from some of the very earliest Greek works right up to the present day. In addition there are background and contextual works on playwrights, theatre movements, genres, practitioners and periods, as well as scholarly monographs, biographies, practical books on acting and stage craft, and over five hundred theatre production stills from the Victoria and Albert Museum Performance collection. 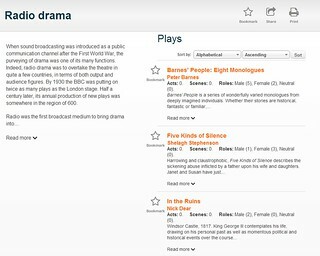 Go to the Drama Subject Guide and look under E-resources. Use the search bar at the top of the page to search for a play, a playwright, genre, or period – or use the links below to browse the collection. Plays: this section contains full texts of plays to read online or download. Playwrights & Practitioners: an alphabetical list of playwrights whose biographies and works you can read in the database. Genres: a list of different genres, and links to plays in that genre. Periods: a list of time periods, and links to plays in those periods. Context & Criticism: access to books on drama, theatre, playwriting. Theatre Craft: access to books on the production and acting. The collection will continue to grow throughout the year. For the list of titles that will be included throughout 2013, visit the Content List. If you click on a playwright, on the right of the screen are any plays you can read, and on the left of the screen is a short biography. Once you have selected a genre, or period, plays in that category appear on the right of the screen, and information on the period or genre appears on the left. You can use this to find new writers, or new movements you may be interested in. 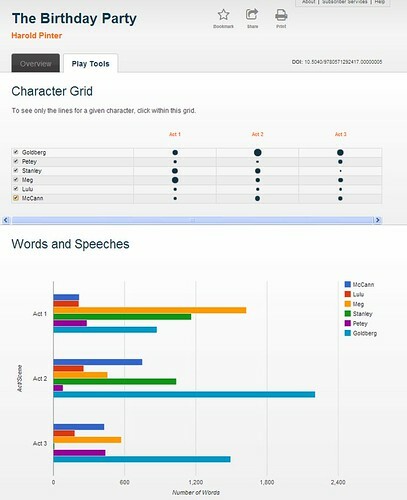 Play Tools include a Character Grid to help you view where characters appear and with whom they interact in the play. You can select particular characters and chart their appearances through the play – or use the Words and Speeches tool to see a precise word count.